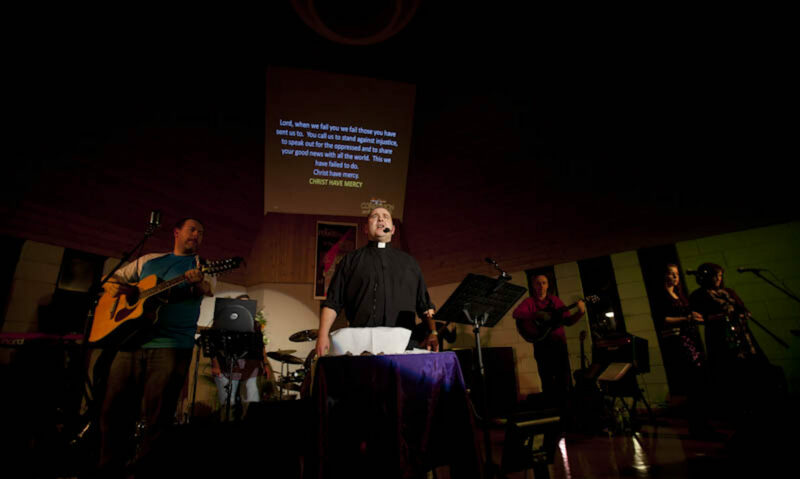 Communion on the Rocks is a powerful new way of celebrating Holy Communion within your church, using traditional Anglican liturgy, popular worship songs, theREIGN’s own original material and a selection of familiar classic and modern rock motifs. It is loud, in your face and fun whilst remaining deeply rooted in the spirit and heart of the traditional communion service. As it is essentially a traditional communion service with a large twist, it is primarily aimed at bringing a fresh, new approach to traditional worship to those already in the church. That said, previous events have been attended by non-believers, and those exploring their journey with God, and we have had nothing but positive feedback from them in terms of what the event meant to them. It is accessible, and non-threatening, especially as (like a traditional rock concert) the lights are down and the volume is up, allowing you to be completely anonymous in the crowd if you choose to be so. We believe that Communion on the Rocks offers something both for outreach and for seasoned (even jaded) church-goers to get a hold of. Click here to view a list of all upcoming and previous Communion on the Rocks events. There are currently eight different versions of Communion on the Rocks: Heaven in the Ordinary, Rising Sun, Though We Are Many, Taking The Step, Burning Heart, Beautiful Day, Saving Me and Across the Universe. The first two were written specifically for the Greenbelt Festivals in 2007 and 2008 respectively, but are not in any way specific to the festival, or even to a festival type event, and can be used unaltered in any church. Whilst the versions share stylistic similarities, and some common songs along the way, various forms of the liturgy are used to create similar but noticeably different atmospheres. All utilise multimedia, and offer alternative forms of confession and intercession in keeping with the overall style of the event. Both Taking The Step and Burning Heart re-use some of the liturgy and music featured in previous versions, where the alternative was to do something different for no other reason than it was different, but didn’t add anything new, and Saving Me is a full “Greatest Hits”. Originally put together to celebrate the 50th Rock Eucharist event, it features music from every previous version and worked so well that the band ran with it through to the end of 2016. For 2017, the band have put together an all new version, called Across The Universe, featuring plenty of new music and liturgy, as well as our first sermon in rhyme.